A public lecture organized by the Hungarian State Secretariat for the Aid of Persecuted Christians was held at KRE with guest lecturers, Rev. Joseph Kassab and Rev. Haroutune Selimian, two church leaders from Syria. The State Secretary for the Aid of Persecuted Christians announced officially that the Hungarian Government is going to support the two Churches, NESSL and UAECNE with 2 million euros this year. 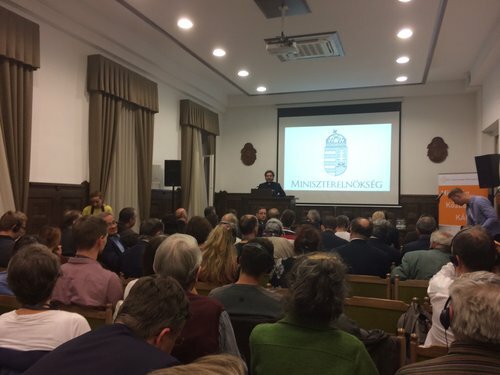 Organized by the Hungarian State Secretariat for the Aid of Persecuted Christians, a public lecture was held at Károli Gáspár Reformed University (KRE) on Thursday, October 11. Rev. Dr. Miklós Kocsev, Dean of the Theological Faculty at KRE, began his welcoming address by introducing the two guest speakers, Rev. Joseph Kassab, General Secretary of the National Evangelical Synod of Syria and Lebanon, and Rev. Haroutune Selimian, President of the Armenian Evangelical Community in Syria. He thanked them for taking this opportunity to share their real life experiences as Christians living in Syria, reminding those in attendance of the fight for faith, and the perseverance we receive when we turn to God. Former Minister of Human Resources, Zoltán Balog, also shared words encouraging the concept of belonging to one body saying, Christians are not alone and Hungarian Christians must recognize the Hungarian responsibility for collaboration in assisting fellow Christians in need. Highlighting the Hungary Helps program, Tristan Azbei, State Secretary for the Aid of Persecuted Christians, emphasized that the Hungarian government was the first to invest in the Christian communities and launch programs for the Christians in the Middle East. 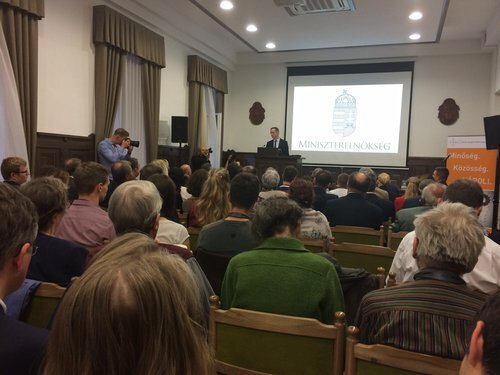 Such programs were started as a fundamental moral duty of the Hungarian government, and not for recognition, but to encourage other Western countries to aid persecuted Christians. This week, Hungarian Prime Minister, Viktor Orbán offered the financial aid of two million euros to support the two partner churches of RCH so that families may finally return to their homes. "The Government agrees with the principle of supporting those Christian families in the Middle-East, and all other families belonging to persecuted religious and ethnic minorities, who stayed in the region of their home country, and of helping these communities so that they can stay in the region. In order to achieve this objective we have to ensure the efficiency and operability of programs aiming the return to their homes of those people who are forced to live today as refugees in the Middle-East." - quote from the Government Decree. “Atrocities in the world happen for two reasons: first, because of those who are ready to commit them, and second, because of those who decide to remain silent,” said Rev. Joseph Kassab. For the first five years during the civil war in Syria, close to half of the population in Syria were killed or displaced. Millions live in humiliating poverty and need. He spoke of the silence that only encourages the hatred that is taking place in the streets of Syria. However, he also highlighted that the strength of the churches in Syria, “In this ugly war, the Church in Syria has learned to be a better Church, taking care of people, including those outside of the Church. The Church is finding deeper meaning in the midst of suffering and pain.” He stressed the importance of speaking up and acting out, “To speak up in words and deeds that Christ crucified is a chance for the Syrians and the world at large to wake up and value human life and the dignity of God’s creation again, and learn the lesson of “never again.” He reminded those in attendance that, as a part of the Church, we must continue to pray to God for mercy and compassion, but “our prayers must be focused so that our hearts are not moved by the hatred and aggression that is being directed toward us.” Rev. Kassab concluded, that in order for Syria and its people to fully rehabilitate and reconstruct, religious communities must be vessels of reconciliation working towards tolerance and restoring schools to encourage the people to stay in their homeland. Read the full speech of Rev. Kassab here. Read the full speech of Rev. Selimian here. Prior to the public event, the two church leaders met with Bishop István Szabó, President of the Synod of RCH to discuss further issues related to the cooperation of the three churches and the ongoing support of RCH. Future plans include a visit of senior Church leaders of RCH in Lebanon and Syria next year.